Diamond Cut Audio Restoration Tools is the next step in audio processing evolution. With DCart10, we have added to, and enhanced the existing tools you know and love and we have made the much easier to find and use. Diamond Cut DCart10 builds on the previous DCart foundation and adds many new features to make it a “State of The Art” audio restoration system. We have again listened to our customers and added enhancements to many aspects of the program. We have improved the click detection and replacement with the addition of our Big Click Filter, added new audio enhancement filters and updated the CD burning capability with a full featured CD and DVD burner. We have added direct support for many more file types like Broadcast Wave, Ogg Vorbis and FLAC files. Clean up recorded conversations, speeches, concerts, etc. Paste Interpolate Icon button for easy waveform interpolation when working with tablet computers. 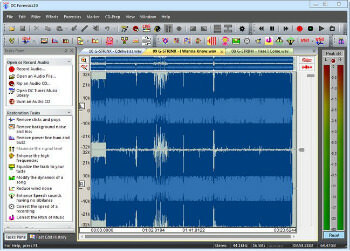 AAC (Advanced Audio Coding) compressed audio file support added for file extensions such as .aac, .m4a, etc. Improved the audio quality of the Stretch and Squish (pitch and tempo change) system. Low Frequency Shelf option added to the Paragraphic EQ. Over 2,000 Descriptive Factory Presets are now provided for ease in “getting started” with any given function. Sampling Rate support extended from 192 kHz up to as high as 210 kHz providing up to 100 kHz Bandwidth capability. Set New Start Time for File feature added. Added offset capability to the overtone and sub-harmonic synthesizer filters for a more natural sound.